A newfound treat of walking up Berkeley’s three-block-short Center Street is the probability of peeking through BAMPFA’s large south-facing windows to see what’s up on the museum’s art wall. Taking up the entire first floor and dipping into the graded amphitheater of its basement, the art wall hosts commissioned murals and installations by artists from around the globe. What you’ll find if you stroll by the museum until July of 2018 is a mural of four riveting larger-than-life portraits by South African illustrator and street artist Karabo Poppy Moletsane. 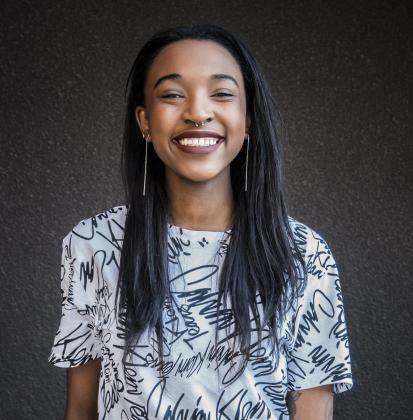 At 25, Moletsane is the youngest artist yet to take up space on the art wall, which has featured projects by Qiu Zhijie, Lawrence Weiner and Terri Friedman. In late November, the artist completed her portraits in warm mustards and rich blues, with a motif of organic lines that vibrate around the curves of her subject’s faces, the kinks of their hair and the folds of their clothes. “The theme that I take whenever I take photographs of people is just people I think are a good representation of where South Africa is now and where South Africa is headed as well aesthetically,” she says. As such, the artist has found subjects in a fashion blogger in Johannesburg, a parishioner of the Zionist Christian Church in Pretoria, a skhothane (a member of a sartorially inclined subculture with pyromaniac tendencies who burn their barely worn designer clothes) and a sharply coiffed young man fresh out of the barbershop. Occupying most of the 60-by-25-foot wall, each of the four faces wears a focused stare, the kind demanded by an afternoon sun. Moletsane explains the colorful bags under the eyes of her subjects draw a focus to their gaze and represent South Africa’s grave history of institutionalized racism and segregation. “We're not pretending that apartheid didn't happen,” she says, “but we're trying to consciously be aware of the effect that it had and trying to look at a positive way to use that to then build the country as strong as it could be.” To that end, beams of light and halo-like effects emanate from her mural’s subjects. Moletsane’s South African identity, along with the scale and contrast required by street art, shape a great part of her work. But the root of her style lies in her fascination with the idea of an African aesthetic. She admits this is not a singular concept but rather, she explains, a collection of hybridized visual vocabularies that centralize native African culture. “I can't say these are the characteristics of an African aesthetic but there's one common thread and it's being able to hybridize cultures in an authentic way and in an honoring way,” she says. Her portraits at BAMPFA are evidence of this hybridity. The images are reminiscent of barbershop and hair salon signage ubiquitous across Africa, while the halos and beams come from Christian art. Moletsane has made a career out of projects that center on and celebrate the people of South Africa. After completing studies in illustration and visual communication, Moletsane started her own creative house, Mother Tongue in 2014. “I thought if I do the norm and go into an agency, I don't think I'm changing [the field], I don't think I'm adding to it. I'm just doing what every person in my position would have done,” she says. 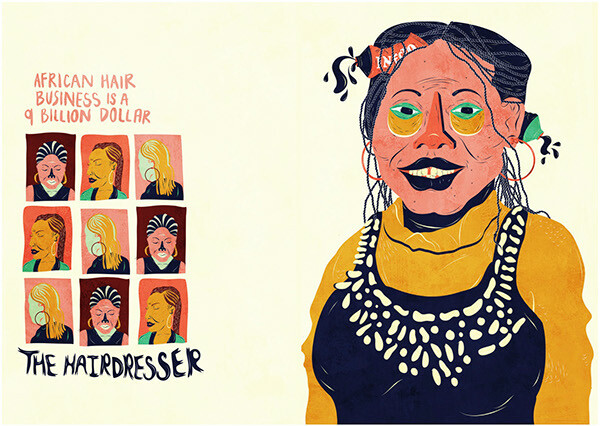 One of her first projects, a 2014 zine titled Sho’t Left, features digitally illustrated portraits of average South African citizens -- from taxi drivers and hairdressers to skhothanes. Moletsane speaks about her country with devotion — the words “honor” and “celebrate” come to her easily and in succession when talking about South Africa. That devotion radiates from her mural at BAMPFA, inspiring in both its stature and details. 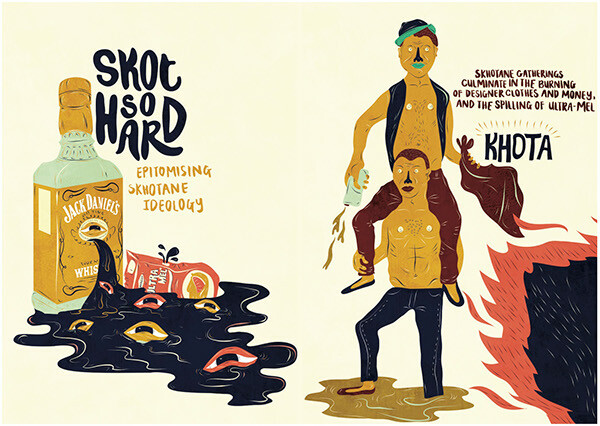 To tell the story of South Africa, Moletsane has chosen to depict the ordinary folks. Her mural holds many lessons: authenticity can permit inspiration, the ordinary citizen is an icon worthy of celebration, and most relevant for a nation like the United States, acknowledging a national past, no matter how horrific, doesn’t impede a country’s progress or pride. In fact, it just might be essential. 'Art Wall: Karabo Poppy Moletsane' is on view at the Berkeley Art Museum and Pacific Film Archive through July 15, 2018. For more information, click here.